15 volunteers, 30 children and Rickman Chia came together for an afternoon of Art Jamming to celebrate life and creativity recently. 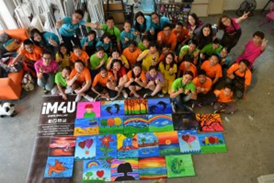 Rickman teamed up with iM4U for a programme which allowed the children, aged between 13 and 15 years from the Ti Ratana Welfare Home, Desa Petaling to explore their artistic side at The Studio @ KL Publika. Organised in conjunction with World Environment Day and iM4U’s celebration of it throughout the month of June, the event was themed “My Beautiful World”. With this pilot programme, Rickman hopes to create a platform for young people especially the underprivileged to enjoy the chance to express themselves through art. iM4U volunteers worked with Rickman to guide the children through the process of creating their art interpretation of the theme. According to Rickman, many people have hidden talents that are not exposed either due to a lack of opportunity or guidance. When he was a child, Rickman’s family could not afford to provide him with art materials and colour pencils were a luxury for him. When his parents bought him a set, he had to use them carefully to make them last longer. Although better known as a singer and host, his artistic abilities were revealed when he began to upload his works onto his social media platforms. Art Jamming brings people together in a relaxed environment with access to art materials and guidance as required. Following the outcome of this pilot session, iM4U will be sitting down with Rickman to plan a series of Art Jamming sessions throughout the country working with iM4U’s youth volunteers. Part of the plan also includes curating an exhibition of the works produced by the children taking part in the Art Jamming sessions. ← What Is A Toy? → 3D Creative Arts intro to Malaysia!